JVC's corporate assimilation into Kenwood may have put product development on hold for a year or two, but now the brand is back with the DLA-X5000, yet another upgrade to what is proving to be a surprisingly intransigent projector design. This is the latest D-ILA beamer to assume entry-level mantle, but at £4,000 it’s priced dramatically higher than the majority of rival 1080p products. Admittedly, it embraces 4K e-shift4 sleight-of-hand and trendy image processing, but that widening gulf will require some hefty justification by many potential buyers. E-shift(y) technology involves crafty pixel manipulation to create an image with the same structural density as native 4K, but comes without the resolution benefit commonly associated with 2,160p content. To create a 3,840 x 2,160 canvas, each pixel is shifted diagonally by 0.5 pixels, thereby multiplying resolution to give an Ultra HD pixel count. Is it really 4K? No. But it’s not exactly Full HD either. The X5000 may look familiar but it introduces a new high-power 265W lamp able to cast a 1,700 lumens image, which is a 30 per cent improvement over its predecessor. As part of this increased light efficiency, JVC has yet again narrowed the gap between pixels on the D-ILA panels. Not only does this aid brightness, it has the added benefit of diminishing the pixel grid structure. Even if you park your La-Z-Boy slap bang in front of the screen, the picture looks delightfully cinematic. One of the more interesting new enhancements promised by this model is compatibility with high dynamic range (HDR) sources. HDR will be a standard embellishment on 4K Ultra HD Blu-ray discs, and looks likely to be adopted by broadcasters and OTT streamers going forward. Proponents argue the benefits of HDR, even on SD content, are more evident than resolution to most viewers. So its inclusion here – a machine tailored at videophiles – makes perfect sense. Clearly the extra brightness on tap helps facilitate HDR. To access the DLA-X5000 with such content, a test MP4 file was proffered. The artsy footage of a model roaming around with a digital camera to her eye would appear to present ample opportunity to showcase enhanced shadow detail, colour depth and neon highlights. However, if this file is anything to go by, the benefits of HDR on this e-shifter are subtle at best. While JVC offered some specific setup tweaks to maximise the HDR picture, the image just looked bleached and noisy. Personally, I doubt the veracity of this HDR test. Without HDR10 (Open HDR)-compliant software and an HDMI v2.0a delivery chain, any assessment of the projector’s HDR chops is little more than a presumptuous observation. Cosmetically, the projector looks no different to previous incarnations. It’s a big, hefty beast that you'll not be able to plonk onto a coffee table or casually ceiling mount. 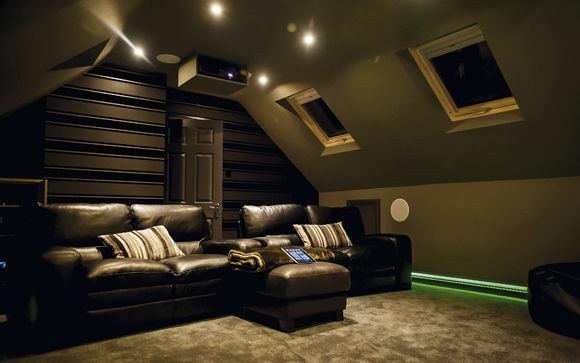 This is a home theatre display, and needs to be accommodated accordingly. On the plus side, it’s available in either black or white. The lens, centrally mounted, is flanked by air vents which run front to back. Hot air is expelled from the front. Connectivity, to the rear, comprises two HDMI inputs, Ethernet (for network control only), a 12V trigger, RS232, and 3D Sync port for the (optional) Synchro Emitter required for use with active glasses. Both HDMI inputs are HDCP 2.2-enabled and will accept various iterations of 4K content up to 2160/60p 4:4:4 – but, of course, once in the projector 2,160p sources are down-converted to 1080p. Beneath the hood you’ll find a trio of 6th-generation 0.7in Full HD D-ILA panels. The supplied remote control is a standard IR zapper, with backlit buttons. There’s also rear-mounted controls on the PJ's chassis. Positioned above this model in the JVC range are the DLA-X7000 and the DLA-X9000. There is some functionality only available on these step-up siblings – here, you don’t get Real Colour Imaging Technology, said to give a more nuanced image, or THX 3D certification. But I suspect buyers will not feel short-changed. While the projector is active 3D compatible, glasses are optional. It should be pointed out that e-shift pixel multiplication is not used when in 3D mode. Don funny glasses and the projector remains unashamedly hi-def. Setup is fast and straightforward. The X5000 features remote-controllable image zoom, lens shift and focus, and the throw is accommodating. At 3.31m you’ll be able to project a picture 110in diagonally. Once up and running, it quickly becomes apparent just how bright this projector is. You can certainly use it in rooms with low levels of ambient light. General usability is average, though, with input-switching between the two HDMIs painfully slow. There’s a pronounced pause and onscreen blackout. To assess the projector with native 4K content, I hooked up a Sony 4K media player, which features a 4K Netflix client. The results were often spectacular – I could scarcely believe I was watching streamed content. The Marco Polo special One Hundred Eyes, which tells the origin story of the show’s blind assassin, is a lavish watch. Black level, long a strength of JVC's D-ILA video-chuckers, is outstanding here. Images are gloriously contrasty: martial arts weaponry glints like jewellery as highlights ping. Dynamic contrast is claimed to be 400,000:1 and native is a still mightily impressive 40,000:1. There's a Clear Black feature adjustable between Low, High and Off but differences are subtle. There's something majestic and theatrical about the DLA-X5000’s imagery. Onscreen texture offers breathtaking detail. Marco Polo has outstanding costume design, which the projector relishes – wools, leather and fur appear three-dimensional. Are we missing resolution? Technically, yes, but you can still see every strand of Kublai Khan's wiry beard. Multiple Pixel Control, part of JVC’s proprietary Super Resolution technology, is an interesting feature, as it automatically sharpens key areas of the image while softening background detail. Just leave the mode to Auto and the onboard science sorts it all out. It’s optional and fun to experiment with. When Mongol riders crest the hill in pursuit of our fleeing hero, there's no dot crawl around their distant silhouetted shapes. The image is remarkably clean and precise. Yet while the projector’s motion handling is good, I'm not entirely satisfied. Blur reduction is managed by JVC's Clear Motion Drive (CMD) and new Motion Enhance tech. Processing is largely benign, but my preference was always to keep things off or at the lowest setting. With CMD running at full pelt, maximum detail is retained during motion but there are clear artefacts around moving objects. I didn’t care for it. Panning is super-smooth but a visual distraction. This may be suitable for concert footage and TV studio material, but not movies. JVC claims Motion Enhance optimizes the drive of the D-ILA device and is effective with both 4K and 3D images. In practice, I found it didn’t have any significant impact on the image. The X5000's user interface is a familiar box of tabbed options: Picture Adjust, Input Signal, Installation, Display Setup and Function settings. Available picture modes are a trio of presets (Natural, Cinema and Animation), plus six user definable pots – three of these can be addressed directly from the remote. For those that want it, the PJ offers extensive adjustment. There’s six-axis colour management and a 12-point manual gamma gauge. There are two different colour profiles – Standard and Video. Colour temperature is variable beyond the 6500K default, and there’s a five-memory screen function. Screen adjustment even allows the user to tweak for colour differences which may be caused by different screen materials. Clever. In the Advanced menu you’ll find lamp control to toggle between Low and High settings. There's a noticeable increase in screen brightness and contrast if you opt for the latter, with an accompanying leap in fan noise – operating noise is relatively good otherwise, with the X5000 generating a consistent thrum easily masked by a separate sound system. The Animation preset, labelled Anime on the IR zapper, beefs up the colour intensity, but not in a leery, noisy way. Colour temperature is automatically increased to 7500K, and it's very effective. Action anime series Black Lagoon (Netflix HD) is awash with deep reds (not orange, as you might see on a lesser LCD model) and vibrant blues. Even the Cinema mode, which on some products might see colour and brightness rolled back to the point of dullness, remains dynamic and engaging. A pixel-shifting 1080p projector compatible with next-gen 4K content and HDR is, by 2016 standards, increasingly quite an odd duck. But I think there’s still room for quasi-4K beamers like the DLA-X5000. Native UHD projectors are not going to get cheaper any time soon, and low-cost 1080p models just don’t offer this level of image integrity or ingenuity. All things considered, picture prowess of this D-ILA model is outstanding. This black box casts high-contrast images with rich colour and excellent detail; the sheer illusory appeal of e-shift4 processing is hard not to like. The projector also looks great straight from the box, and having both HDMI inputs HDCP 2.2-compatible is a boon, at least from a system integration point of view. It's good to see JVC back in the game and widening the choice for bigscreen AV-holics.